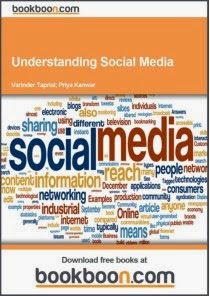 "Understanding Social Media" is an eBook written by Varinder Taprial and Priya Kanwar that is available for FREE Download from Bookboon.com. This ebook delves into the evolution of Social Media, its benefits for individuals/ businesses and social media management. Contrary to the general perception of social media being restricted to networking websites like Facebook & Twitter, the social media encompasses all the services that facilitate creation, sharing and exchange of user-generated content. These include but are not restricted to Internet forums, groups, blogs, micro blogs, networking sites, social bookmarking sites, wikis, podcasts, content communities for articles, video/photo sharing sites, Q & A sites, review sites etc. Each type of social media has its own benefits and there is something for everyone. Unfortunately people tend to partake in the most popular websites and expect them to fulfil all their needs instead of settling for a service that best serves their needs. If one has focused objectives and knows exactly what he wants, s/he would certainly find a social media platform that will meet his/her particular needs. As time passed by, people realized that it was not only their petty issues which the social media could sort out, but by working together they could also influence decision-making. In their own right, each individual was turning into an influencer within his network, some more than the others. They now made a difference whether it was a simple recommendation on a product or something bigger like enlistment of support for a public cause. They are now being recognized and known as “Social Influencers”.